Lauren Conrad’s engagement ring from William Tell was revealed in October 2013, about a year after the two started dating after meeting on a blind date on Valentine’s Day the year before. The happy couple were married on September 13 of 2014. The engagement ring is a classic round solitaire set on a yellow gold band. Like Lauren Conrad’s engagement ring, this incredible solitaire from Brilliance is simply set on a delicate yellow gold band for a look that’s both timeless and beautifully feminine. The fit of this ring is comfortable, and it’s classic profile makes it an excellent choice for pairing with other jewelry favorites of different styles. Born February 1, 1986, Lauren Conrad is an author, fashion designer, and television personality. Born and raised in sunny Laguna Beach, California, Lauren attended Laguna Beach High School. At the age of 18, she was cast in the reality TV series Laguna Beach: The Real Orange County. Two years later, in 2006, Lauren was commissioned to star in her own spin off of The Real Orange County; this time, she starred in The Hills, a reality TV series that chronicled her personal and professional life, along with those of her friends, Audrina Partridge, Heidi Montag, and Whitney Port. She stayed very busy during the show’s production, attending the Fashion Institute of Design & Merchandising while holding positions with both Teen Vogue and Kelly Cutrone’s PR Firm, People’s Revolution. Conrad left The Hills after its fifth season concluded in May of 2009. Later that year, she launched the fashion line “LC Lauren Conrad.” In 2011, she launched a second fashion line, “Paper Crown.” She displayed even more creative might by writing books at the same time, relasing the L.A. Candy book trilogy in 2010 and The Fame Game series in 2012. Lauren’s performance in The Hills earned her several Teen Choice Awards for the Choice Female Reality TV category. She won the category in 2006, 2007, 2008, and 2009, and was nominated again in 2010. In 2013, she was nominated for and won the Young Hollywood Award in the SodaStream UnBottle the World Award category. Lauren and former musician William Tell tied the knot in September of 2014 after dating for two years. The two enjoy their lives together in California, often stepping out for Red Carpet events and continuing Lauren’s tradition of having a very pretty life. Did you know that Lauren Conrad is a dedicated volunteer who encourages everyone to exercise their voting rights? She collaborated with Seventeen magazine in filming a public service announcement for Declare Yourself, which was a campaign that encouraged young adults to get registered to vote in time for the 2008 presidential election. What Our Experts Have to Say about Lauren Conrad’s Engagement Ring. It’s clear the Lauren Conrad’s engagement ring was chosen to complement her looks and personality. The two-carat round solitaire is just the right size for her hand, and while clarity and color haven’t been determined from the photos available, the value is estimated at $20,000 to $40,000. Celebrity jewelry designer Jennifer Fisher told E! News that “Lauren’s ring is quintessential timeless perfection when it comes to choosing a setting that will stand the test of time. One quality about it that is exciting is that she has updated her gold color to yellow, where there has been a trend for the platinum bands recently.” We couldn’t agree more. Whether you’d like an exact replica of Lauren’s uber-classic engagement ring or if you’d simply like to use it as inspiration for an elegant, understated design of your own, you can use the fantastic online tools at Brilliance to create a look that’s just as lovely while staying true to your sense of style. 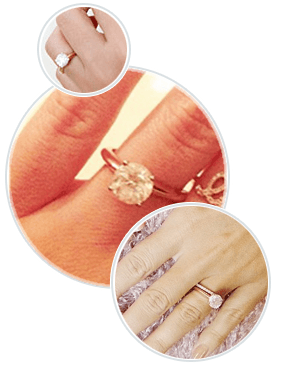 Let the diamond experts at Brilliance help you to create the perfect look to represent your love while bringing beauty and sparkle into your life.